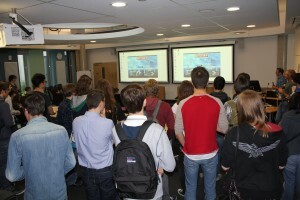 Recently I visited the University of York Computer Science department for the second year running to see the Raspberry Pi being used to great effect on the new intake of students. Last year I visited to judge Blue Pi Thinking, and since it was such a great success they decided to repeat the exercise this year. There are two elements to the challenge and the students can choose either (or both or neither!) The first is Blue Pi Thinking, where the challenge is to develop something creative; the second is BattlePi. 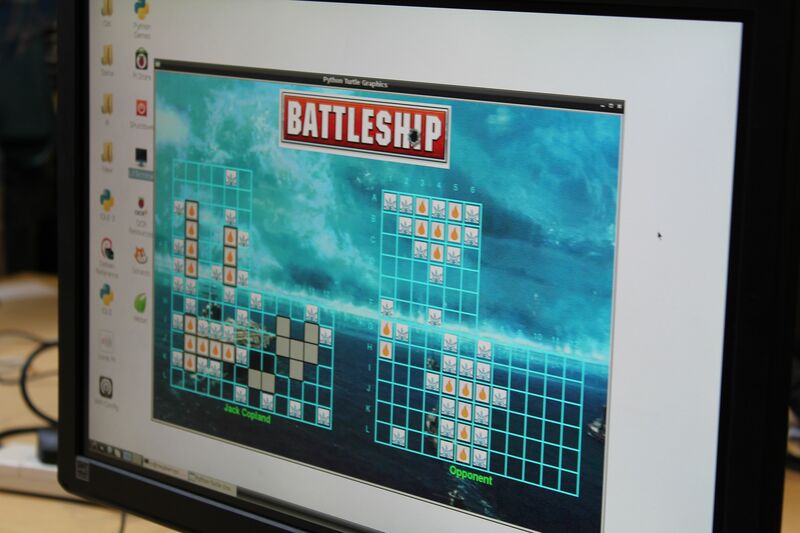 BattlePi is a game of battleships played automatically by the Raspberry Pi with a server through which two Raspberry Pis can communicate. The students are given the (well commented Python) software which initially just chooses random positions to make shots at. The student then has to modify the python code to implement better AI in both firing position and ship placement. At the end of freshers’ week the students all come together (with beer of course) to test their creations. Playing card recognition. From first principles, the student had captured a picture of a playing card, thresholded it, segmented it to find the pips and count them (OK, it doesn’t work with face cards yet!) Then they apply an edge following algorithm to the pip to work out if it’s a heart, club, diamond or spade. I’d just like to say… Awesome! Ultrasonic theremin. This student had taken a standard ultrasonic transducer and used it to create a theremin, again of some awe. Raspberry Pi mosaic creator. This project was another very complex algorithm, which takes a picture on his Android mobile phone using his own app and transmits it to the Raspberry Pi. Then the Pi calculates the best match from a set of images for small sections of the image based on a calculated ‘average’ colour for the region. Then the software makes up the final image as a mosaic of the select set of images, and transmits it back to the phone! Throughout the year the students will be using their Raspberry Pis to continue their education, and help develop next years BattlePi competition. Will Smith and Emma Hogson, who are in charge of undergraduate admissions have offered Raspberry Pi their complete BattlePi materials including all the software and instructions so we can give it to other universities…something we’re looking into with great interest. May the worldwide BattlePi commence – watch this space! What is the legal drinking age? While most students her in the USA would probably drink a beer or twenty, it is not legal until they are 21. One exception being that a married woman in New Mexico can get permission fron her husband to drink at any age. In the UK the legal drinking age is 18. I kinda thought that might be the case. How can I in South Africa get a copy of the battle ship source?